Is Being Pretty Worth It? This book sat in my TBR pile for a while before I picked it up. It took me a while to get into it but once I did, I really enjoyed it. All Tally knows is that when she turns 16 she will have the operation that everyone has to make her a pretty. The life of a pretty seems glamorous and Tally is excited to be reunited with her best friend who had the operation before her. When Tally makes a new friend, Shay, she begins to question the life that she has always known. Her journey leads her to the Smoke where all the people who have escaped the pretty operation live. Tally fights an inner battle of turning her new friends in or staying in this free life she has found. This isn't a book with a lot of action in it, so if that's what you are looking for, you probably won't find it here. If you are a fan of the dystopian genre, I think you will enjoy the first book in this series. I readily devoured this book in just a few hours, even sneaking off to read it right after dinner (and thereby missing the dishwashing, a win-win, in my opinion). I read a lot of books and when I say 'a lot' I mean hundreds a year. I average more than a book a day. 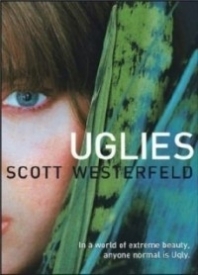 And Scott Westerfeld's Uglies is one of the first this year to really capture my imagination as something new, intriguing, and different. In a far off dystopian future where everyone is considered hideously ugly until they have extensive cosmetic surgery at the age of 16 and no one bothers to ever leave the cities, not everything is as rosy as the ruling leaders would like the citizens to believe. Tally Youngblood has been anxiously awaiting turning Pretty ever since her best friend turned. But in the final months before her birthday, she meets up with Shay, who isn't sure she wants to turn Pretty at all. They bond over pulling pranks, but Tally doesn't even truly consider Shay's stance until Shay disappears on their shared birthday and Tally is picked up by the evil and manipulative Dr. Cable. The rulers-that-be threaten Tally with everlasting Ugliness if she doesn't find Shay and the community of non-Pretty rebels who live out in the wilds beyond the city. With no real choice and encouragement from her parents and friends, Tally sets off with only a cryptic note left by Shay to guide her. Against all odds she actually makes it to the Smoke, the 'city' established by the non-Prettys. Soon Tally is torn does she activate the pendant given her by Dr. Cable and turn in the people who accepted her and took her in (especially their leader, David, who falls hard and fast for Tally and she for him) or does she give up her youthful dreams of turning Pretty and stay in the Smoke? Her love for David and a conversation with his parents about what else happens to you when you turn Pretty (which explained to me how everyone turning Pretty also turned into vacuous partygoers with no thoughts to fill their Pretty heads) decides Tally and she destroys the homing device. That inadvertently leads to the utter destruction of the Smoke, as Dr. Cable planned for every contingency. At novel's end, there are few rebels left, Shay has turned stupid and Pretty, and David learns the truth about Tally's role in their current situation. There's a lot more than that, but I feel like I've already given enough away (though there's so much more). This is a novel to make you think about personal choice and responsibility, honor, trust, right and wrong. There's also action, drama, intrigue and love. What more could you ask for? I recommend this novel for ages 12 and up and for readers of any age that want a thought-provoking read. Now, I'm just waiting for Pretties, the second novel, to come out. I loved how different this book was to most that I have read. The plot and the story line are good and I really injoyed the characters. The only thing I was disappointed in was the last good was of a different character but I still loved how it fit in the the other books. I devoured this novel in one sitting. Uglies is such a unique and compelling sci-fi adventure - it is almost impossible to put down. Tally was an incredible main character and such a great role model. She is one of my top ten book girlfriends. And David - oh David. His and Tally's relationship was beautiful to watch develop - love them more than anything. The plot was so different and intriguing. It is truly one of the greater YA novels out there. Do yourselves a favour and read this novel. I really loved this book. I found it very different in its approach to the YA dystopian genre. I loved the different ideas it brought up, and the way two worlds lived side by side, separated by a birthday. It is a great start to a series that keeps you guessing, but also gives you enough to assume that you are always following the action and the characters. Tally is wonderful, and I love seeing her grow and change through the book! This book is wonderful if you enjoy dystopian novels. If you love Divergent, The Hunger Games, or the Matched series, you will probably enjoy this book too. I enjoy reading books set in the future where the government tries to keep the people in their control and somehow everytime the heroine defeats them in some way this is that type of story. I think you will enjoy the read if you give it a try. If you liked the Hunger Games, this book is for you. As I read Tally YoungBlood's story, Katniss Everdeen was not far from my mind. If you like strong heroines, you will like Tally. True to the young adult genre, there is also a love triangle, but I like Westerfield's take on it. Instead of love being the force that drives Tally, it exists outside the main plot line. It is a secondary plot to a much bigger cause. Finally, the adult take on this is that it teaches a lesson that most teenagers forget. It is admirable to walk your own way, to be independent, and to never let anyone else think for you. Seeing teenagers lose their individuality on a daily basis inside the walls of a high school has helped me see the value in this novel. After all, we are all Uglies, and the book shows that there is no superior race. This world that Scott Westerfeld has created is amazing! Basically Uglies is about a society where at the age of 16 you can get a surgery that turns you pretty. Everyone who doesn't get the surgery is considered ugly. Uglues and Pretties live in separate places. Uglies live in Uglyville while Pretties live in Prettytown, where you can party all the time. Where your only job is to have fun. This book just left me speechless. It was wonderfully written and the setting is amazing. The main character in the book Tally Youngblood has a very unique personality. She is very strong throughout the book even she had to by herself to the smoke to save her friend Shay. I highly recommend this book! This book left me speechless! I could not put it down! Westerfeld’s vision was so clear, and the story line was amazing. The concept of the book was so different from anything I have read so far. There was never a dull moment for me. I would highly recommend this book to anyone! Tally Youngblood is counting down the days until she turns sixteen. While most girls would be planning parties and getting new cars, Tally is looking forward to becoming a PRETTY! Her best friend Peris has already transitioned to New Pretty Town, the place you get to go once you become a pretty, and is able to do all the things pretties do. They throw extravagant parties, dress in the best clothes, and people actually like them. Uglyville is nothing like that. The uglies usually keep to themselves and refuse to venture out until they have their turn to move to New Pretty Town once they turn sixteen. Tally cannot help but sneak away one night and try to meet up with Peris in New Pretty Town, even though it is against the rules and can probably get her in a lot of trouble. She has been so lonely since he left. This changes on the night she surprises her long lost best friend. He seemed so angry with her for being there, and makes her promise she will not get caught and will not do anything to keep her from becoming a pretty again. In an attempt to flee after being discovered, Tally meets up with another ugly, Shay. She has been sneaking out at night also. Shay and Tally become fast friends, and realize they have more in common than most. They share the same birthday. This means that they will be turned together! They will not have to watch the other one leave without the other. This is why Shay’s news of running away to a rebel camp shocks Tally beyond belief! Who does not want to become a pretty?! Although Shay tries to convince Tally to go, in the end Tally decides to stay. Shay leaves her a set of directions just in case she changes her mind, makes her promise to keep everything a secret, and they part ways. Will she ever see Shay again? Will she ever make it to The Smoke, the rebel camp she left for? Tally cannot believe that her surgery is finally here! This is what she has waited her whole life for! She is going to be a pretty and do all the things the pretties do! Right…. WRONG?! The surgery is put off and Tally is escorted to a place called Special Circumstances. Once here, she meets up with Dr. Cable and is presented with a proposition. She has to infiltrate The Smoke and spy for Special Circumstances in order to become a pretty, or she can stay an ugly for the rest of her life. But what about the promises she has made? Can she keep both promises to both friends? She has no choice. In order to get what she wants, she has to rat Shay out. As Tally embarks on her journey, she begins to speculate about The Smoke. What if she cannot figure out the encoded instructions? Thanks to Special Circumstances, no one even knows where she is! She travels for days until she reaches the field full of beautiful white flowers. Is this the place the letter describes? The smell of fire is what jars her awake the next day. In an attempt to flee, she is “rescued” by a helicopter full of…. PRETTIES!? They call themselves the rangers and are from another city. Although they are part of the clue, they have never seen The Smoke. At last, she makes it to The Smoke. Still at odds with herself, she explores the runaway camp. Never does she expect to change her mind about revealing the camp, nor does she plan on falling for a guy her best friend likes! After a couple of days at The Smoke, David, the crush, takes her to meet his parents. Tally is shocked to discover they used to be the operational doctors for the pretties. They share some information that may turn the tables for good. While doing some research, they discovered that they pretties are technically being turned into mindless robots. Suddenly all the rave of being pretty in not enough for Tally. She has found love and a place where she belongs. But happiness is short lived when Special Circumstances appear out of no where. What has she done?! In an attempt to retrieve the pendant, Tally escapes the clutches of Specials. She makes it to a secret hideout and finds non other than David! Thank God they did not catch him! This would be the perfect time to tell him everything. He deserves to know, but Tally just cannot do it. She cannot lose him too! David and Tally know they have to attempt to save the smokies. Without their help, they will all be forced to become mindless pretties. After a couple of days, they make it back to Special Circumstances and with the help of some uglies cause a diversion and make it inside. What they find is quite a shock! Who will be left standing in the end? Make sure you grab this book and find out! It is definitely worth a read! The Uglies is about a society that has their children, at age 16, receive plastic surgery. Almost like a rite of passage into adulthood, and if you don't get the surgery, then you're considered ugly to the rest of society. I absolutely love dystopians, and I made sure I absolutely DEVOURED this book up. Scott Westerfeld is an amazing writer and the book is perfection and an easy read. If you haven't read The Uglies, then you need to. Loved the book. it was recommended to me by a few different people and hadn't really given it any thought. Can't wait till I get a chance to read the next book in the series! I loved this book. I thought it was an amazing and adventurous and everything a scifi book needed. Over all amazing!